I recently listened to an interesting interview of Mark Riebling, the author of a new book entitled Church of Spies, detailing Pope Pius XII’s clandestine efforts to undermine the Third Reich. Riebling claims that Pius XII coyly kept the Nazis at bay diplomatically, all the while using an intricate network of spies and operators, priests and laymen, to plot against them. I haven’t had a chance to complete the book but hope to have a report soon. In the meantime I offer some brief observations of the dynamics in Germany and Rome leading up to Eugenio Pacelli’s controversial pontificate. Under his predecessor, Pius XI, Pacelli had been the papal Nuncio in Munich and Berlin, and then Secretary of State; he was known to have affection for the German people but be obedient to the Church first, a key point with the rise of the National Socialist party. Cardinal Pacelli had negotiated the 1933 Concordat with the German Reich, the agreement which was to protect the rights of the Church in a country in which She had endured several centuries of struggle already. The Concordat has been analyzed and criticized over the decades; was it a piece of defensive brilliance or a capitulation to evil? Of course the Nazis never had any intention of preserving the Church under their twisted scheme of a pagan master race. 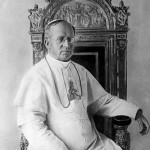 The terms of the Concordat were violated by Hitler immediately and regularly, prompting Pacelli to complain bitterly to Berlin, and Pius XI in 1937 to issue a powerful and scathing encyclical on the Church and the German Reich, Mit Brennender Sorge (With Burning Anxiety). As Riebling’s research indicates, the Germans understood that Pacelli himself was influential in strengthening the original language of the encyclical, including its “incendiary” title. Thus the initial indications that Pacelli was no Nazi sympathizer. I invite you to read Mit Brennender Sorge in the context of the very real fear (it had already started) of German Catholic clerics and laymen choosing state over church. It is at once a rebuke of the Nazi regime and her German (and Catholic) followers; a cautionary note to those still in the fold; and a sharp challenge to all German Catholics to suffer and endure. And, it might even offer us a lesson or two about obedience and steadfastness in the face of a secular tide. Here are a few quotes I found interesting, understanding that Pacelli himself would soon be responsible for the several hundred million Catholics around the world, during a time when the very fabric of western civilization was beginning to tear. Saint Boniface, pray for us! The experiences of these last years have fixed responsibilities and laid bare intrigues, which from the outset only aimed at a war of extermination. We thank you, Venerable Brethren, your priests and Faithful, who have persisted in their Christian duty and in the defense of God’s rights in the teeth of an aggressive paganism. No coercive power of the State, no purely human ideal, however noble and lofty it be, will ever be able to make shift of the supreme and decisive impulses generated by faith in God and Christ. The priest’s first loving gift to his neighbors is to serve truth and refute error in any of its forms. Failure on this score would be not only a betrayal of God and your vocation, but also an offense against the real welfare of your people and country. If there is one thing We implore the Lord to grant, it is this, that Our words may reach the ears and the hearts of those who have begun to yield to the threats and enticements of the enemies of Christ and His Church. He who searches the hearts and reins (Psalm vii. 10) is Our witness that We have no greater desire than to see in Germany the restoration of a true peace between Church and State. But if, without any fault of Ours, this peace is not to come, then the Church of God will defend her rights and her freedom in the name of the Almighty whose arm has not shortened. In light of our past discussions about the sometimes linguistic imprecision of our current Holy Father, the quotes above are like arrows through a bullseye. Indeed. A couple of other ideas that might bear further discussion. One, that Pius XI was ministering to his flock instead of to the world, a theme which we’ve touched on recently but briefly. Secondly, more learned junto friends than me probably know whether and how to connect the dots of apostasy vis a vis Germany – Luther, the Concordat as a political compromise, the lure of Nazism over Church, and now the present day dissension of the Kasper crowd. Are there just bad seeds long planted there that keep sprouting? Just a thought.